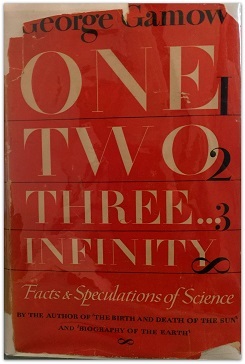 One Two Three... Infinity: Facts and Speculations of Science is a popular science book by theoretical physicist George Gamow, first published in 1947, exploring some fundamental concepts in mathematics and science, but written at a level understandable by middle school students up through "intelligent layman" adults. The book is illustrated by Gamow. George Gamow (March 4, 1904- August 19, 1968), born Georgiy Antonovich Gamov, was a Russian-American theoretical physicist and cosmologist. Cantor theorem. Encyclopedia of Mathematics. The set 2A of all subsets of a set A is not equipotent to A or to any subset of it.